In a real business operation, employees can access multiple doors within the company. To improve security, restriction of access need to be taken into great consideration. Managing access to key operational areas and restricted places is assuming increasing importance for organizations everywhere, from small entrepreneurial companies to large corporate enterprises and government bodies of all sizes. Even the most neutral organization now recognizes the danger of a door security breach. 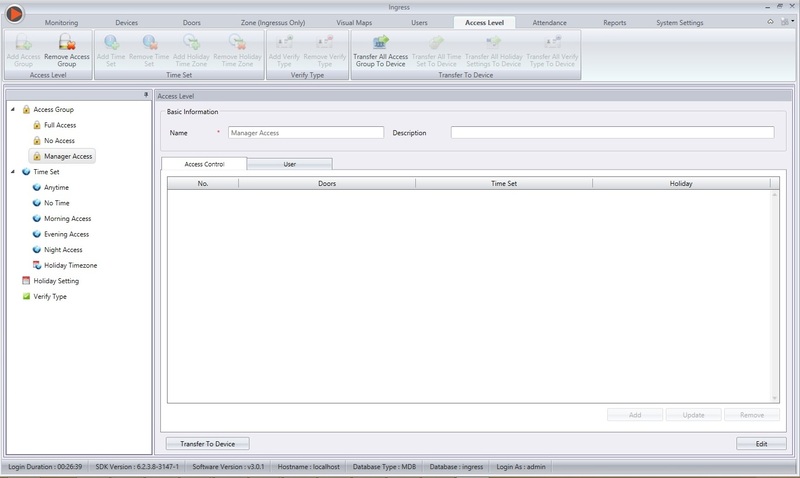 With the Ingress software in place, administrators can easily limit the door access of unauthorized employees at different time period for different doors and this can all be done under the Access Level tab. 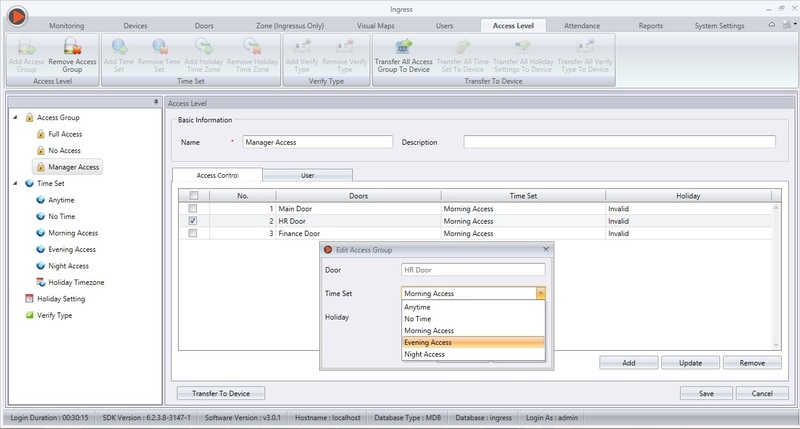 Administrators must create different time sets to allow access under the Time Set section, for example Morning Access, Evening Access and Night Access. 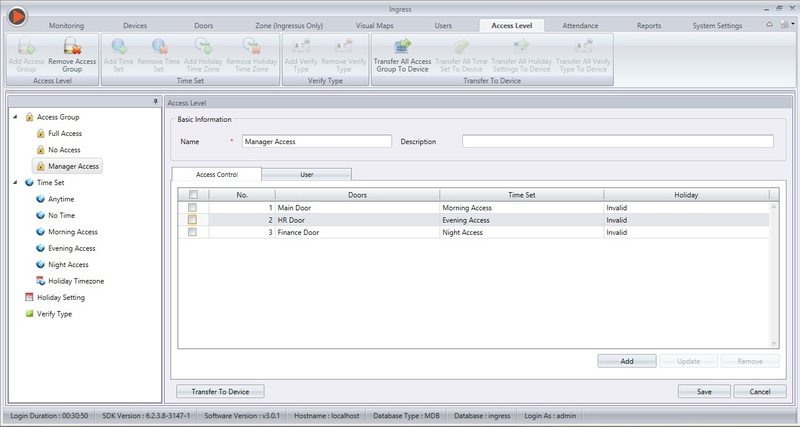 First create a new access group, for example Manager Access under Access Group section. 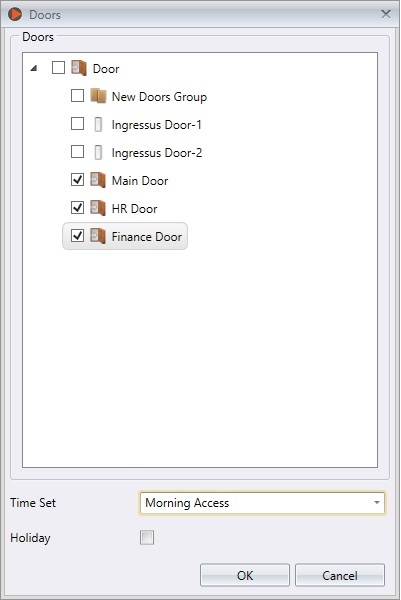 Click Add to select doors to allow for authorized access, for example the Main Door, HR Door and Finance Door. See the screen below. Do not select any Time Set at this moment as we will configure it at the next step. Click OK to save settings. Ingress will display the list of doors under this Manager Access Group. Check the checkbox for HR Door, followed by clicking on the Update button. Now you can select the Time Set to apply to this door, for example Evening Access. Repeat the steps for Finance Door, which only allows access for Night Access only. Finally, finish the control access setup for different doors with different Time Set. The last step is to select employees to be included within their respective groups. Click on the User tab and follow the on-screen instructions to complete the settings.